Product prices and availability are accurate as of 2019-04-20 13:34:03 UTC and are subject to change. Any price and availability information displayed on http://www.amazon.com/ at the time of purchase will apply to the purchase of this product. Imagine that one sunny day You look at wooden or laminate floor and see it was all covered with scratches by the seats and chairs. Felt furniture sliders for hardwood floor X-PROTECTOR® prevent the appearance of such problems in the future and protect wooden surfaces in Your home from scratches and scuffs! 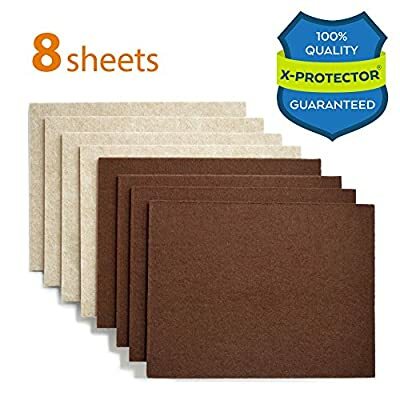 HIGH QUALITY - felt chair pads X-PROTECTOR® are made of high-quality eco-friendly felt and gives to Your floor, furniture and other surfaces SOLID PROTECTION against the ANY FURNITURE LEGS and other items. TENACIOUS ADHESIVE - our chair leg floor protectors has tenacious adhesive, which doesn't allow them to come off from furniture legs as fast as it comes with cheap pads and TIGHTLY HOLD PADS on the furniture for a long period of time. 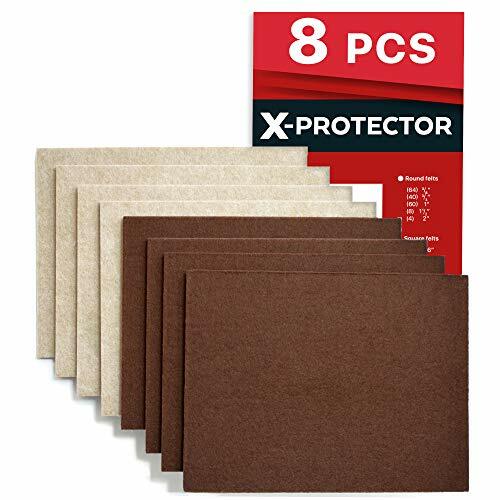 1+1 COLOR in BROWN&BEIGE PACK - 8 HEAVY DUTY 1/5" SHEETS 5 4/5" x 7 4/5". You have in the kitchen bright furniture and dark in the rooms? Or vice versa? Here are 4 Brown wood floor protectors and 4 Beige hardwood floor protectors. You can cut pads of ANY FORM YOU NEED for any type of chair legs, furniture feet and other home items. ELIMINATE THE POSSIBILITY OF SCRATCHES WITH FELT FURNITURE PADS X-PROTECTOR®!
? FORGET ABOUT SCRATCHES! 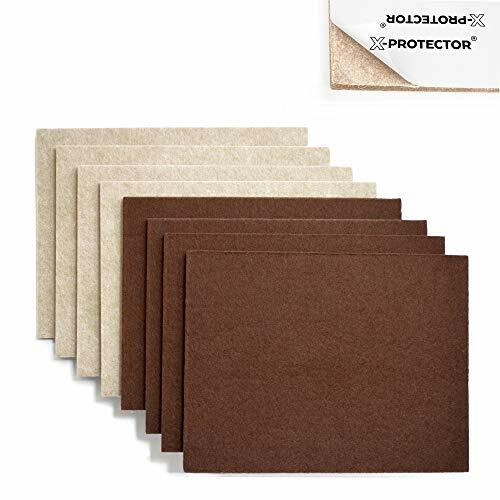 Furniture felt pads X-PROTECTOR® - best protection for Your wooden, laminate or tiled flooring in Your lovely home. Our furniture coasters create shield between floor and furniture, desks & tabletops, which carefully protect surface from scratches and scuffs. ? 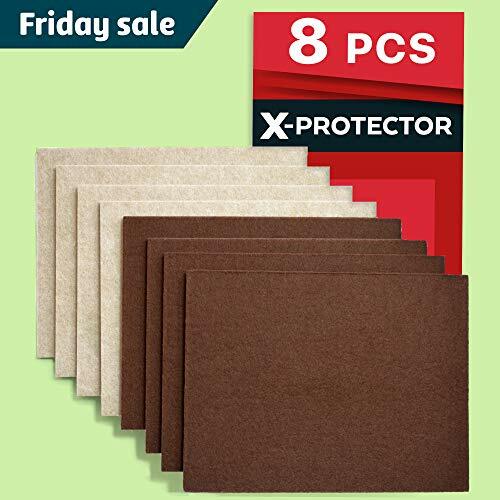 ONLY NOW 8 THICK HEAVY DUTY 1/5" BROWN & BEIGE PACK X-PROTECTOR® - 4 Brown & 4 Beige Sheets. Your chairs has round legs, recliners has big square legs and Your couch needs a special size? 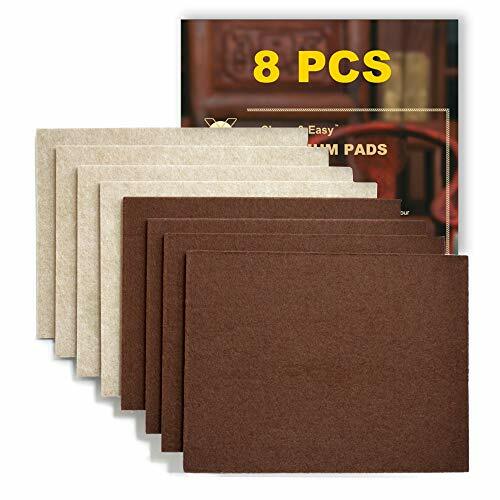 CUT SIZES YOU NEED of felt floor protectors for ALL Your furniture. ? X-PROTECTOR® SIUTABLE FOR ANY HOME FURNITURE ESPECIALY HEAVY - our wood floor protectors are perfect for any type of chair legs, furniture feet and other home furniture. CUT & STICK felts to furniture feet - and You will move ANY FURNITURE without any damages and scratches to Your floor! ? X-PROTECTOR® STRONG MATERIAL AND TENACIOUS ADHESIVE! Our furniture pads are made of strong eco-friendly material with recycled fibers. Tenacious adhesive guaranteed You can easy stick it to any furniture surface and be sure it will hold on and protect for a long time. ? X-PROTECTOR® IS A REGISTERED TRADEMARK - AVOID THE COPIES. WE GUARANTEE OUR CUSTOMERS 100% SATISFACTION WITH OUR PREMIUM FELT FURNITURE PADS! IF YOU DON'T LIKE OUR HARDWOOD FLOOR PROTECTORS - WE WILL REFUND YOUR MONEY - JUST TELL. ORDER IT NOW RISK FREE - PRESS THE BUTTON «ADD TO CART» RIGHT NOW!